The new blog is written by teachers, trainers, students and staff from all the departments within our school. You'll find posts on classroom advice and lesson planning, exam preparation and study techniques, preparing for CELTA and life after CELTA and much much more. You can also keep up-to-date with everything happening in the school and language learning and teaching generally on our Facebook, Twitter, LinkedIn and Google+ pages. Martin Oetegenn teaches on IH London’s IELTS Preparation course, below he offers expert advice to help IELTS candidates get the score they need. Students often tell me that they have no time to plan for the IELTS writing task 2, but planning can seriously improve your score. The ideas in your writing and how you organise them can have a significant impact on your final score. If you’re not sure how to do it, here are some tips. Read the question below and write down any ideas you have. Try not to spend more than 5 minutes. Now look at the two plans below. Which one do you think is better? Although plan a) has some good ideas, they are not organised into paragraphs and there are no examples. This means the writer will have to stop and think a lot when they write. They won’t have much time to focus on their vocabulary and grammar or to check their writing for mistakes – this is so important if you want a good score. Plan b) is divided into 3 main ideas. Each idea can be used as the main focus of a paragraph, which is a good way to organise your ideas. Because there are at least 3 examples for each paragraph it should be easy to write 250 words. So next time you write, make sure you spend at least 5 minutes on your plan – It really makes a difference! Welcome to IH London's blog! International House London is a language school and teacher training centre in the heart of London. Welcome to our blog! Here you can read about typical lesson activities, meet some of our students, find out about the school's social activities, keep up to date on events in the school, and learn about our charitable work. 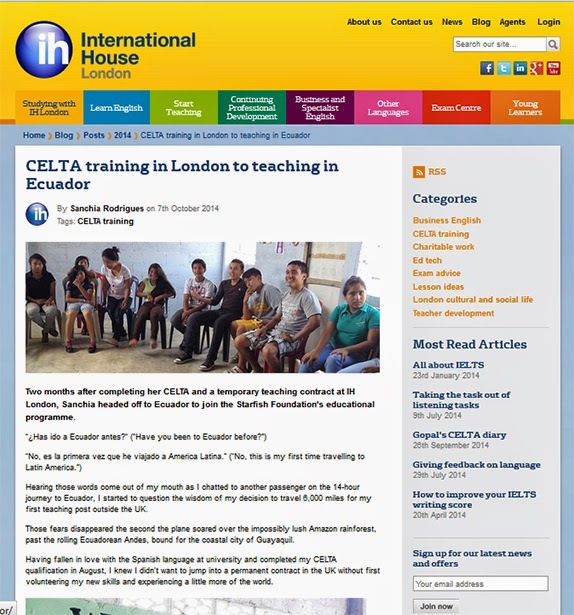 International House London is a language school and teacher training centre in the heart of London.